I've heard a lot about this 'dooce' website but I've never gone to look at it. I actually went to a Mormon church on the recommendation of classmates when I was in high school. I went to it for about 9 months. 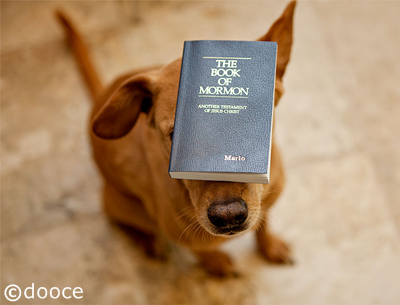 I read the Book of Mormon and the Doctrine & Covenants from cover to cover. Without going into the details here (because it was so long ago and I don't really remember the details anyway) I concluded that the whole church is a load of garbage based on fairy tales and moved on with life. and costs you 10% of what you earn. Brad- Rowena said dooce® earns $40,000 a month for ads on the dooce® website. Not too shabby. .... I know what you mean about LDS. However, that's the same view that the Jews and Muslims hold of Christians. Nate- but just think how much you save by abstaining tea, coffee, and alcohol, gambling. And how many people would take time off to fulfill missionary missions overseas. Ann- maybe she wants to be the next Racheal Ray. The fact that she quit the Mormom religion might make the brethren misinterpret how she meant the photo. Nate- churches must have taken huge losses with their investments the past few years. No news about it, though. OK... I just finished watching Lost and I still have questions! What about those number sequences... and... never mind. I don't want to be a spoiler for anybody who hasn't watched it yet. Kay- they didn't resolve the questions because they wanted to leave fans "lost." LOL. The fact that you don't read any of her stuff can only mean one thing - but I won't say it. Amazing how a dog photo always save the day. Buahahaha! Nate- Those priests ought to have their balls sliced off before even a dollar of the hush money was paid out. Then there's that excuse, "but they only human." Ann- still, the members who gave the money should have the right to know where it went. This brooches another point about their tax exemptions status, for example, profits from investment properties like apartments building, shopping malls. These have very little related to supporting religion. There was a report out a while ago how much taxes the state loses out from business properties owned by nonprofits. Rowena- You owe me big time. Yeah, the family dog adds a lot to that site. Brad- "dooce" originally derived from a habitual mis-pronunciation or something, I forgot what Heather wrote.